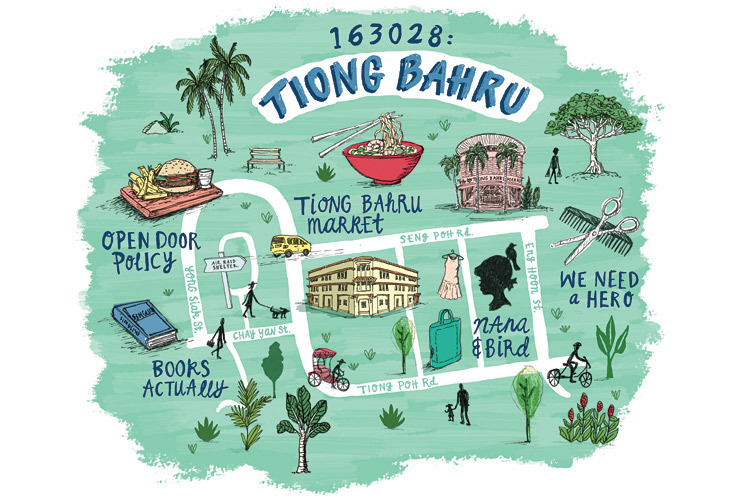 Not only were we lucky enough to have Annie Davidson create our Spring Summer 2015 season posters, she will also be showcasing her beautiful and intricate illustrations at our Melbourne SS15 Market this weekend! 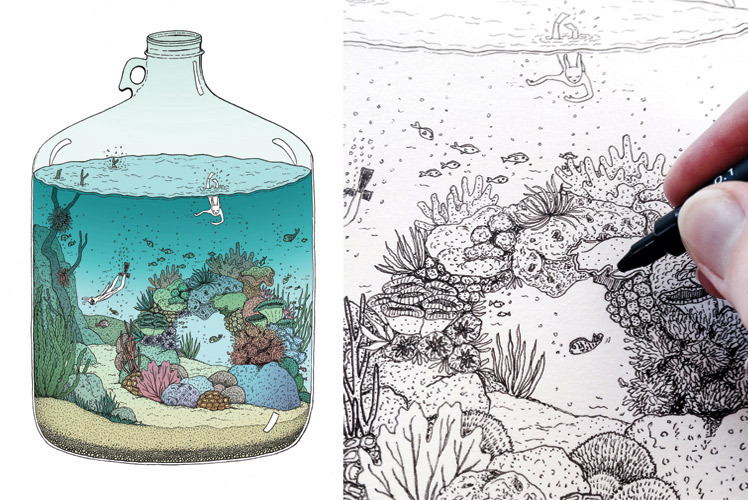 Read on to discover more about the process of this talented illustrator. I have a couple of styles that vary between projects but most of my work is bright, fun, nostalgic and imaginative with lots of pattern and detail. 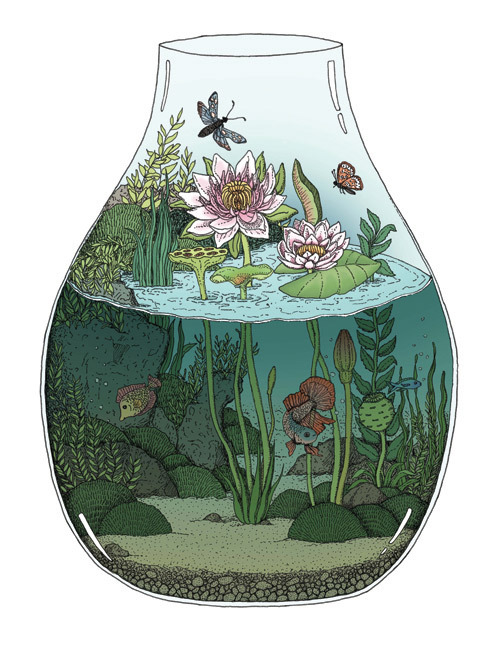 I flip between drawing whimsical little worlds in glass vessels, bonsai pots, tree-houses, dinosaurs, cactus gardens and other bits and pieces. 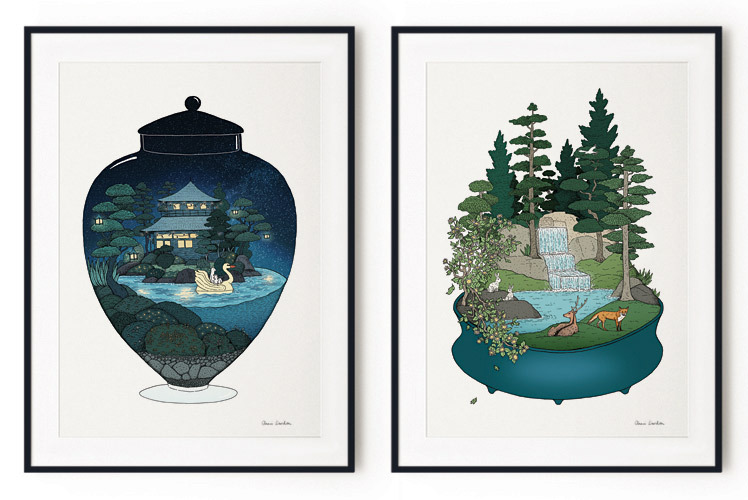 I have a series of prints called the ‘travelling whimsies’ which follows little nomadic woodland type creatures who journey from one land to the next riding in flamingo boats, swinging on tyres, exploring Japanese gardens and the like. Over time my style has become more varied to grow with the range of work I do eg. packaging, textiles, kid’s books, album artwork etc. and I’ve been using bright inks/watercolours a lot more lately too. I’ve been drawing and making things for as long as I can remember. My mum is an artist and there are lots of creative people in the family so I’ve always been surrounded by art. As a kid I made matchbook sized picture books, tiny fimo characters, hand sewn dolls and other crazy things. I studied Graphic Design at Monash and my first design job at ‘Tiny Me’ had me drawing quirky characters for kid’s products most days so it has just grown from there. 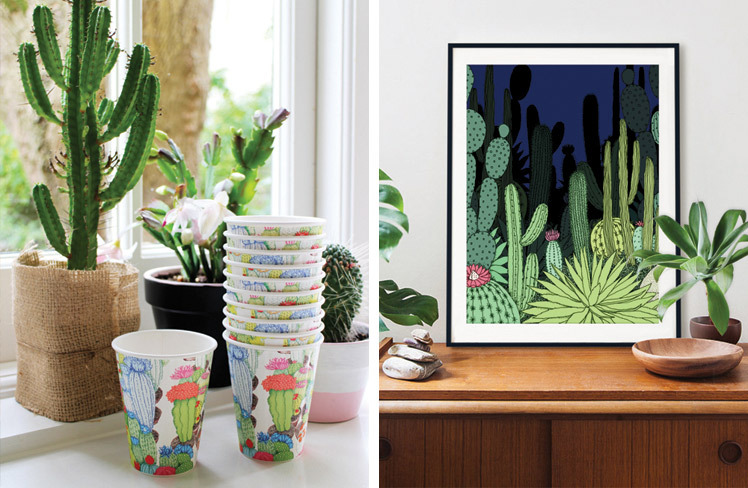 After Tiny Me I worked at homewares company Mozi where I created prints for lots of cool products and in the last couple of years I’ve been freelancing full-time. I have lots of books – kid’s picture books, botanical art, Japanese woodblock prints etc. (many that I’ve borrowed from mum’s studio), and lots of pinterest boards too. 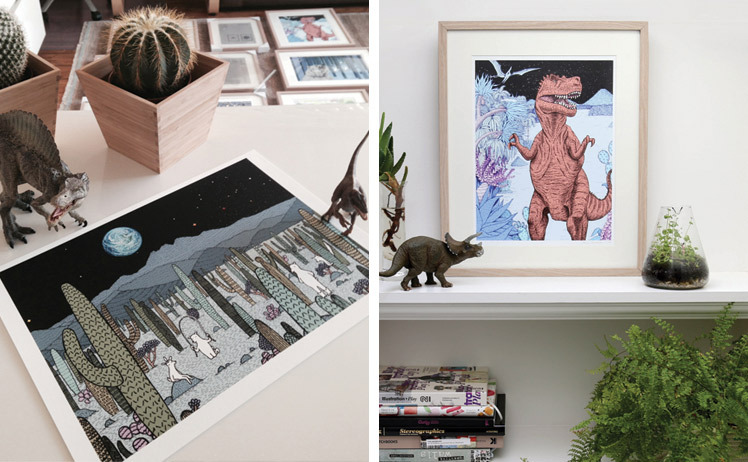 Some favourite artists include Yoshida Hiroshi, Oliver Jeffers, Olaf Hajek, Micah Lidberg and Ernst Haeckel. Other inspirations includes old movies like Swiss Family Robinson, travelling to new places and of course nature – especially tropical landscapes. I currently love drawing underwater scenes, waterfalls, bugs and jungle scenes, and often need to get outside for a walk and fresh air to keep ideas flowing! Fineliner pen, ink, watercolour and pencil. I like to scan in a mix of things from watercolour splashes to detailed sketches and overlap them to create a collage or pattern. I have two workspaces at the moment which keeps things interesting. One is at the Windsor Workshop on Chapel Street where I share a space with lots of other creatives who are great to be around. 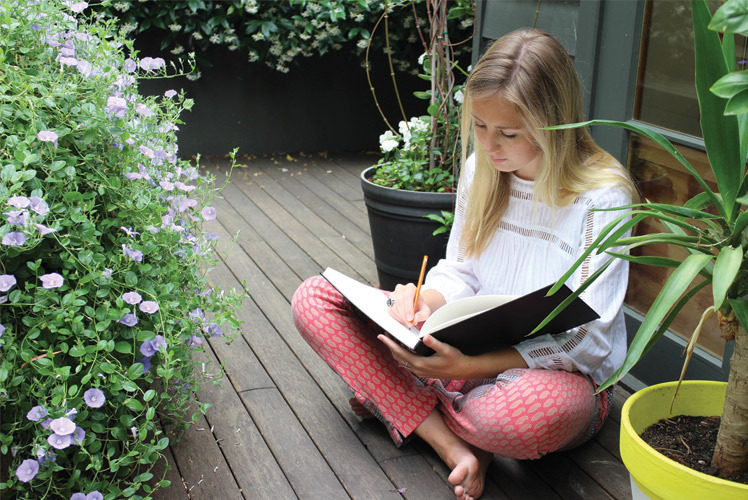 The other is a desk at my share-house loft in Kew which looks out onto beautiful heritage gardens. I have a drawing table there and pin up lots of images for inspiration all around me. I always start a project by creating mood boards and little sketches. Sometimes the initial rough sketches become part of the final work. I then scan the work and finish the colouring or composition in photoshop usually. The main thing is to keep drawing and building up a collection of personal works which will help you develop a style. It’s good to be versatile but also to have consistency to your work so it’s recognisably yours. Try to get your work seen by as many people as possible through a strong online presence, entering competitions, knocking on doors, emailing companies and publications etc. It takes ages to get started, so you just have to stick at it and be persistent. It’s also a good idea to do short courses eg. business, product photography etc. and to get some experience working in the industry for a while before you start freelancing so you can get an idea of how businesses work before starting your own. The best thing about freelancing is the variety of clients and projects. Illustrating a kid’s book for Medibank last year was a great experience. 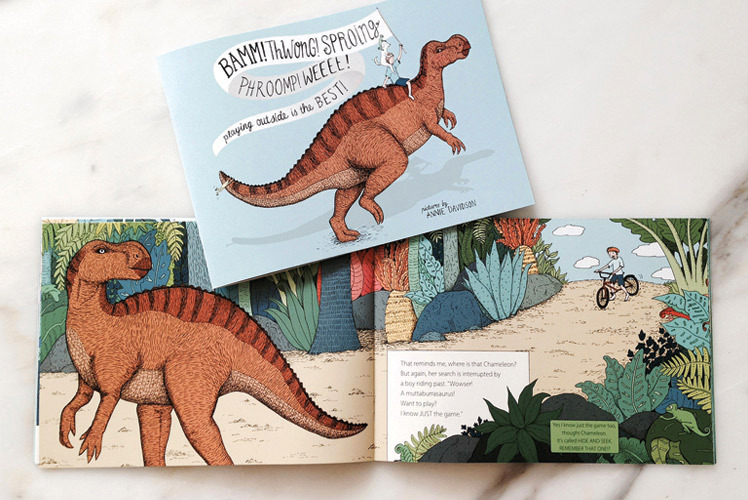 As part of their ‘generation better’ program Medibank built a giant dinosaur playground and made a kid’s book to coincide with it’s launch. More recently I’ve enjoyed creating pictorial maps for Jetstar’s in-flight magazine, a commissioned print for Converse and album artwork for various musos. I hope to keep developing my style, adding prints to my store and collaborating with exciting companies. I’d love to make my own kid’s book featuring my ‘travelling whimsies’ and maybe create a series around this. I’m also keen to get into designing more prints for textiles and maybe even start my own homewares or fashion label at some point.